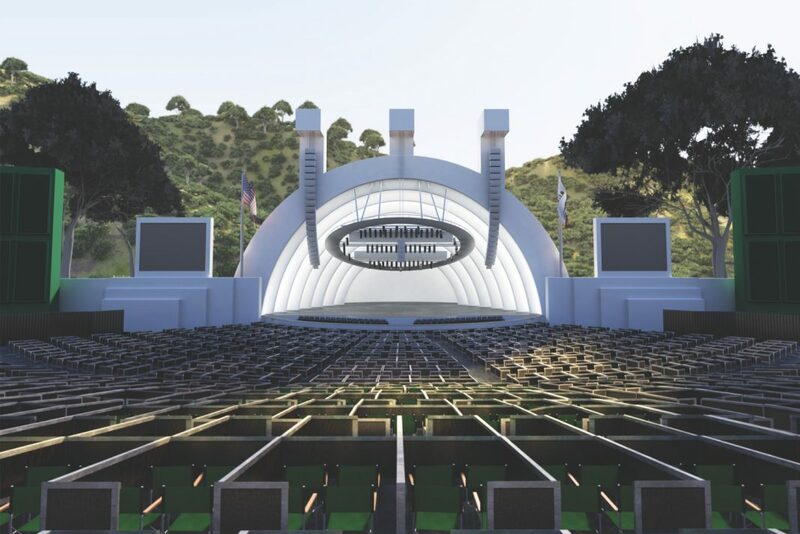 In 1920 two women equipped with a grand piano and a makeshift stage made from a barn door performed the first-ever concert in what would become the Hollywood Bowl. At the time it was a popular picnic spot that went by Daisy Dell or Bolton Canyon; nearly 100 years, one name change, and five band shells later, one of the world’s largest natural amphitheaters may also be its most famous, drawing hundreds of thousands of visitors each summer. Here’s a closer look. The amphitheater’s name refers to the bowl shape of Bolton Canyon, a natural amplifier that helps trap sound waves. Ambient noise became difficult to manage as the area for the audience expanded (permanent seating arrived in 1926), hillsides were modified, and L.A. got noisier. The first sound system was added in 1928. Five promenades separate the bowl’s 18,000 seats. While a nosebleed bench seat can cost as little as $1, a box seat might fetch $100. The priciest tickets will secure you a spot by the proscenium in the “pool circle,” which replaced a 100,000-gallon pool that from 1959 to 1972 featured water and light shows. Today it includes its own concierge and food service. The latest shell, built in 2004, brought with it a revamped sound system, and the old shell’s fiberglass noise-dampening spheres that Frank Gehry designed made way for the 50-by-85-foot elliptical “halo” that hangs above the stage. With adjustable, computer-controlled “wings,” it reflects sound downward, like the ceiling of a concert hall, allowing ensembles to hear themselves better. One early shell was pyramid shaped; an elliptical one debuted in 1926. Composed of steel, fiberglass, and shotcrete, the current shell was built in 2004, taking the place of a 75-year-old version that looked much the same but was 30 percent smaller—too cramped to accommodate the entire L.A. Philharmonic. LED light strips run along the inside of each of the shell’s concentric arches. “Barges” built into the back of the shell are loaded with fireworks before special events like the July 4th Fireworks Spectacular. Choreographing the program based on audio recordings of the music takes several weeks; on show night a pyrotechnician sits at a manual control panel, watching the conductor, reading the music, and timing the explosions.